Topic of the Week: What did you play over the holidays? Now that it’s properly 2015, it’s time for Topic of the Week to return home after its winter holiday, no doubt spent somewhere warm, away from the rain and snow. But, while we’re talking about holidays, we want to know how you spent yours, specifically, what games you played. Did you get through games bought in the countless end of year sales? Perhaps you finally started to chip away at that Steam backlog? Or maybe you wanted to spend time with family and friends, which obviously requires some sort of multiplayer shenanigans. Let us know in the comments. I didn’t have much free time for gaming over the break, lamentably. It was actually the longest holiday I’ve taken in about four years, but I couldn’t spend it chained to my PC. I did manage to steal enough time to faff around in The Sims 4, though. Christmas brought with it a free update with festive treats and new careers. I enjoyed the game a lot at launch, but it’s taken me a bit longer to realise that this is the most fun I’ve had with the series. Thanks to the free updates, it’s the best Sims base game. Dragon Age: Inquisition demanded a bit of my attention, too. I could have finished the game a long time ago, but I so enjoy exploring the gargantuan world that I’m trying to do everything, which will probably keep me occupied for another 20 or so hours at least. Most of my gaming time was actually spent on my *gasp* Vita. When I picked it up late last year it quickly overtook my 3DS as my main handheld, and I’ve been pouring as much time as possible into Persona 4 Golden. Anyway, enough from me. What about you lovely people? 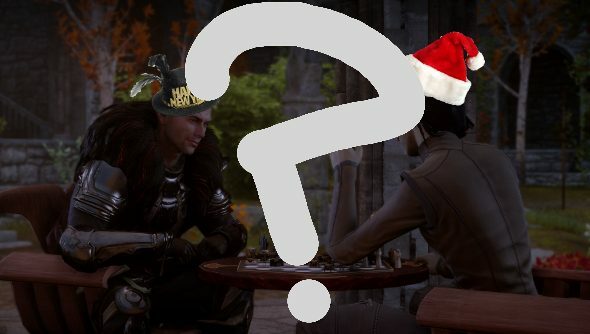 What have you been playing over the holidays?